If the classroom is the first stop in the learning experience, the library is the next destination. You may already be familiar with the library at CPCC, but don’t miss out on another invaluable resource—the Charlotte Mecklenburg Library system. All CPCC students, regardless of county of residence, are eligible for a Charlotte Mecklenburg Library card. 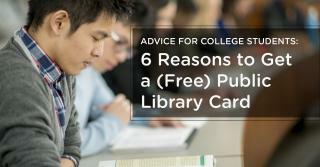 Here are six reasons to include a public library card on your list of school supplies. Learn more here.